I can’t say it enough—I had a great Christmas! I got so many pawsome things; one better than the next. When TW got up, she put Pop’s gifts under the tree. I scaled the gifts like Mount Everest. Woohoo! Note: I think that top box was empty and that’s why it’s caving in. After all their gifts were opened, TW opened MY gifts. I went nutz for the Tickle Tease wand toy that I wasn’t even supposed to get. The company mixed up our order. I can’t believe I still don’t have a tickle pickle. I’ve seen them on a bunch of blogs and tried without success to win one. Now TW ordered one for me and they didn’t send it. Maybe I wasn’t meant to have one. I did enjoy the wand toy they sent in place of it. Santa Claws was good to this little ghetto kitteh. Can you believe I still haven’t let the peeps clean the wrapping paper up from the floor? It doesn’t get much better than a wand toy and wrapping paper … except maybe the little red dot and wrapping paper. If you can’t see the video, you can watch it on YouTube. We hope you, Pop and TW had a great Christmas. We can't believe you've convinced the peeps to leave your wrapper papers. You HAVE to give us your human training techniques! HahaMeow! You could get LOST in all that wrapping paper!!! For a mistake, that is an awesome gift, CK! I just want to say, my human cleaned up the wrapping paper and stuffed it into the recycling bin Christmas NIGHT! She is no fun. You get them to leave the wrapping paper on the floor? Your peeps are so much better trained than ours! Looks like you had a good Christmas, CK! We loved your video!! Wow looks like you had such a wonderful Christmas!! The wand toy, and wrapping paper, that's the best! grate mewvie ck, N tell yur mom ta look for de tickle pickle on amazon...if her orders 23 her can get free shippin!!! anda free box two:). enjoy de week oh end!! Whoa, CK! What an awesome Christmas you had! All that wrapping paper...that's more fun than the toys! We wanna see how long you get to keep all that paper. That was one super Christmas CK!!!!! Wow that was a fantastic Christmas CK. We sure hope you let those folks you ordered from know they didn't send you the right thing and that they do the right thing and send you a tickle pickle. WOW = what a great Christmas you had CK. that new wand toy looks like great fun. Now myself, I've never gotten into the wrapping paper craze - don't know why - just doesn't appeal to me. Hello my sweet darling! This is the most exciting video of you EVER! So much tummy exposure! You were so womanly and excited playing with your new toys! And all that wrapping paper! What a great Christmas! I loved your card and the Human laffed and laffed and she even took it with her on her little trip to share with everyone and they laffed too! I hope I can come over soon and play with your toys and maybe snuggle a little??? CK, the boyz here are HYPERVENTILATING after viewing the lovely grey spot on your chesticles! Awesomeness! Looks like you're having great fun! What a wonderful pile of wrapping paper! Well done CK! Piles of paper with red dots and wand toys dipping in and out giving you a good case of the "Tease" !! Looks like you didn't even miss the tickle pickle AND it's an excuse for your human to TRY TRY again with another order! WOOT! 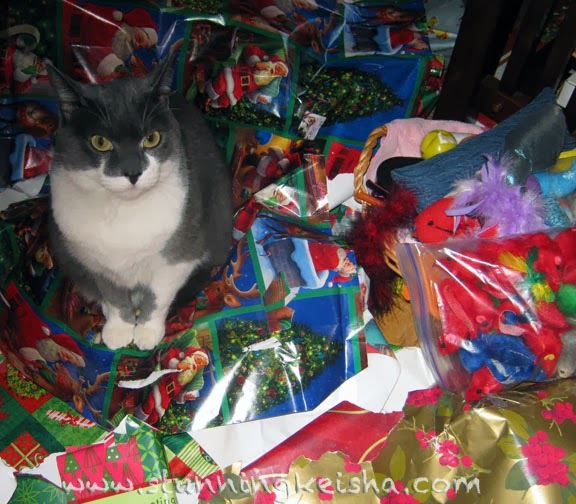 How pawsome to get to play with the Tickle Tease on top of Christmas Wrappers Mountain! Wow, your new toy sounds awesome and we love the video of you playing in the wrapping paper, what fun! Wrapping paper is the best! The day after the kitties opened their presents, I had to wrap one last thing. I was in my office and the minute Russell heard tissue paper, he was at me side.